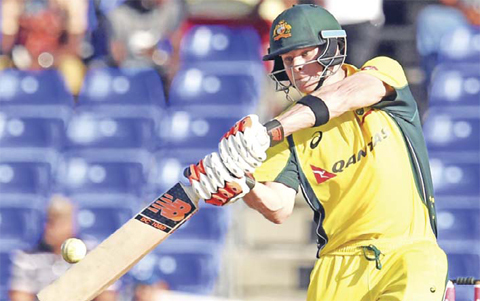 BASSETERRE: Australia showed the stuff of champions and South Africa’s suspect temperament was again exposed as they crashed to a 36-run defeat in the fourth match of the Tri-Nation One-Day International series at Warner Park in St Kitts on Saturday. After David Warner’s first ODI hundred away from home anchored the World Cup holders to a challenging total of 288 for six the Proteas relied on composed half-centuries from Faf du Plessis and Hashim Amla to establish the launchpad from which they looked destined to reach the target comfortably. However the dismissal of captain A.B. de Villiers for 39 at 210 for four in the 38th over changed the complexion of the match as they lost their last seven wickets for 42 runs to be dismissed for 252 in the 48th over when Imran Tahir was run out. Opening bowlers Mitchell Starc and Josh Hazlewood played key roles in the capitulation, as did leg-spinner Adam Zampa as they all finished with three wickets each. “I really can’t explain what happened,” a deflated de Villiers said. Australia have now opened up a fourpoint lead over the South Africans at the top of the standings ahead of Monday’s fixture at Warner Park where the West Indies, a point behind the South Africans, will seek to get their campaign to reach the June 26 final back on track. Poised for a total well in excess of 300 when Warner and Usman Khawaja (59) were in full flow during a 136-run secondwicket stand, Australia’s loss of momentum over the final 15 overs of was put in perspective by South Africa’s composed chase until they lost wickets and their nerve. Amla’s typically serene 60 set his team on their way. He lost Quinton de Kock to Hazlewood after an opening stand of 35 but was then entrenched in a 105-run stand with du Plessis. By the time the fastmedium bowler returned to remove Amla via a good low catch by Steve Smith at short extra-cover, South Africa needed only to maintain progress. However Starc drew du Plessis into chasing a wide delivery for George Bailey’s catch at backward-point to send him back to the pavilion for a topscore of 63. De Villiers looked to be in complete control until he was bowled heaving at Hazlewood, and when Adam Zampa earned an LBW verdict against Farhaan Behardien, South Africa, at 221 for five in the 41st over, were toppling. Starc ripped out three wickets and Zampa joined in the rout before Tahir’s demise sealed the result. “Once we got A.B., we knew we had a chance,” Hazlewood said.